If football (soccer) is not your nation's favorite past time you may not be able to see all or some leagues or matches on television. Sometimes, matches may also not be broadcast because another match is considered more important, or you may be fan of another nation's team but cannot really watch its matches because they are not broadcast by national TV stations. 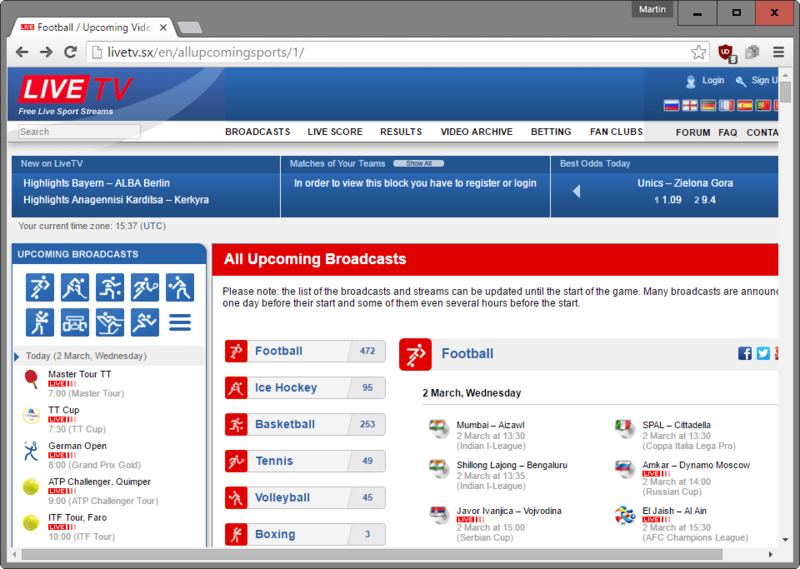 If that is the case, you can try and find an online stream instead to watch the match in a browser or software program. I'm going to provide you with the means to do so. There are several core differences between browser-based and software-based TV streaming solutions. Browser-based solutions are easier to use as you only need to click on a link to start the stream. The only prerequisite is a modern web browser that supports Flash or, if the site uses modern technology, a HTML5 supporting web browser. The downside is that you are bombarded with advertisement most of the time which will certainly reduce your enjoyment. Software-based solutions need to be installed and run only on select operating systems - usually Windows - because of that. While that is a hurdle, they display less ads and are more user-friendly because of this. I'm highlighting several websites that list football matches and their streams. Note that the majority of sites lists streams shortly before kick off only. Live TV - This is a Russian website but you can switch the language to English, German and a couple of others by clicking on the flags in the upper right corner of the screen. The site covers football as well as other sports such as hockey, tennis, basketball, American Football or Cricket. To watch a match click on one of the icons in the left sidebar. Matches of the day are displayed to you. Click on a match of interest and a list of Streams are displayed to you. Each stream is highlighted with a percentage value indicating its overall quality. Click on the play icon to start watching the match. wiziwig.tv - Another live sports website that displays streams to all major football matches on its website. Unlike Live.tv, it is also displaying links to software players which makes it interesting. The site itself is easier to browse and it is usually a good idea to go here to see if a match you are interested in is listed here. I suggest you check out our MyP2P Alternatives guide for additional alternatives. Most sites mentioned in the guide feature all important European leagues, internationals, Champions League and Europa League. Ads are often placed on top of the screen. You need to find the small x icon to close them down. Sometimes, you may have to wait 10, 20 or 30 seconds before it becomes available. Some ads try to deceive you by displaying missing plugin warnings. This is not true and you do not need to click on them to install plugins. Sopcast is without doubt one of the most popular and long standing solutions for software-based TV streams. The program displays a couple of channels in its interface when you run it, but there is usually no indicator here if they broadcast a match or not. That's why you need to check out sites such as Wiziwig to find stream links. All you have to do then is to click on the link on the site which is automatically opened in the Sopcast client. As I said earlier, you will experience less ads all in all which is great. Plus, you get a couple of extras like changing the size of the play window. Most websites indicate which software a particular stream may require, and link to downloads often that you can follow. It is generally recommended to check these downloads for viruses using services like Virustotal before you run them on the local computer. Streams may come and go quickly. This is especially true for web-based streams which often go down during broadcast. If that is the case, go back to the site that linked the streams, refresh the page and click on another stream to load that instead. The operators of the service create new streams as soon as they go down. Find out how to stream football, Champions League, UEFA, or national leagues, using your browser or specialized streaming software. It is well done and has many links using various programs as well as Sopcast. It also links to American sports and others. I think that those website are great tools..